At the 2006 NAMM Summer Session, a meeting of musical gear manufacturers and retailers being held in Austin, Texas July 14-16, CAVS introduced a unique iPod dock/karaoke station. 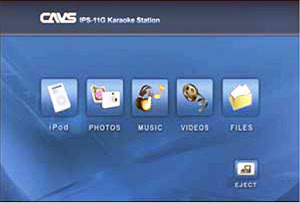 The CAVS IPS-11G Karaoke Station, is a turbo-charged iPod dock that does all the usual docking chores‚Ä¶..plus karaoke. The Station is designed to access multimedia files on your iPod or USB storage device and let you view the files on your TV screen. It comes with a very capable remote that lets you search and select files through the iPod‚Äôs original menus on the TV screen. The Station can play files in MPEG, MPG, AVI, DAT, VOB, MP3, JPEG, MPG, GIF formats, and also karaoke files of MCG-MP3 format. 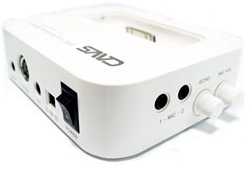 CAVS IPS-11G accesses your ipod or MP3 player and plays the files into your home audio video system. More information is available at the IPS Station site.